I saw the title of your blog and came running – er, limping…I have knee pain and have considerable arthritis around both kneecaps, marked on the right and moderate on the left. I am going to study what you’ve posted to learn more. If I may, might I suggest that in the future you break up such valuable information into multiple smaller blog posts? It’s hard to absorb so much at once! Thanks for bringing this information to us. Thank you for your suggestion. 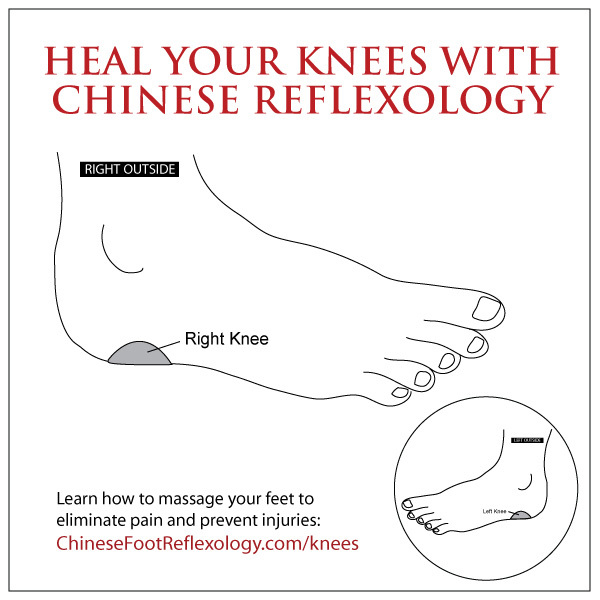 If it feels right for you, I highly encourage you to try massaging your knee reflexology points. It will help the Qi to keep flowing through your knees. Thanks for your comments! EFT is an awesome tool for moving stuck energy. I look forward to checking out your blog too. Love reading about how knee pain is all related to resistance to change which makes perfect sense and is the pain point for exhausted people pleasers since that is the women I work with. I am going to pay attention to when my knees speak! Ahh, interesting connection between knee pain and people pleasing. So very true! Thanks for this post. My knee pain has subsided since I’ve cut down on sugar, but I’ll definitely try the massage points when they’re bothering me, like today, when I’m wearing different shoes than usual. Great info! I hope your knees are feeling better and that they feel amazing all the time! does shoe changing also reduces the pain in the knee? I appreciate this post thank you. I just started getting into reflexology and I find this really helpful. I have had some pain in my knee and it feels close to overextending a lot lately. I’ll try using this technique. Thank you. I think I will probably have to get an MRI too once I get my insurance in order but either way it will feel good to have some relief!! I appreciate that bit about the psychological aspect as well. That shows some parallels in my own life too. Thank you. I appreciate your writing style as well. It’s very simple and straightforward, sometimes humorous, and clear. thank you. Just read you blog on knee injuries. I dislocated my right knee in 1975. It was left ‘out for some weeks’ now I struggle with it. Extra weight gains because I can’t run, exercise much. I am unable to bend my knee enough to massage as described. Any suggestions as to how I could massage and relieve pain? Perhaps you can ask a friend or relative to massage the point for you. Alternately, I’d recommend gentle stretching daily (e.g. reaching for toes, might just be reaching for knees to start). While it may take a few months to regain enough flexibility to massage your foot, you should see improvement in your flexibility in a few weeks. Once there is enough gain in flexibility, the knee point can be reached while standing when the knees are slightly bent. If it feels a bit wobbly to stand this way, you can use a piece of furniture for balance (e.g. sturdy table to help support). So, I was concentrating all of my energy into the middle of my hand. I did it with such power, my hand bent and my whole body got paralyzed with a lot of pain. What has happened? And thanks to your blog, even though I do not have high blood pressure, I healed my depression! And I healed my knees well. Thanks for this blog! I’m not sure. I’ve never heard of this occurring before. It sounds like you have some powerful energy flowing through you. Perhaps take a more balanced and relaxed approach in the future. As well, If there is somewhere near you where you can learn Qi Gong or Tai Chi, you may want to check it out. This is a wonderful article. thank you. I have a knee injury from transforming my belief system and going through massive life changes. The inability to be flexible and move forward and being stubborn might just be the cause of my knee pain. The reflexology and affirmations are helping. I have my own website where we give wholehearted advice on how to better connect to the supreme energy and I find your knowledge and wisdom has taught me a lot. Thank you! You’re very welcome! It’s wonderful to hear that the reflexology and affirmations are helping! Holly, This has been very helpful in overcoming my knee pain that comes and goes. Great site for knee pain thanks so much Holly it has given me a lot to ponder on ! I cannot wait to see how long it will take for knee ache to go away and will take note as yesterday I really thought I would not be able to get home from tube station as I could not walk comfortably. Holly, this is a great post. I had knee and foot problems for seven years. Initially, I thought that the pain and discomfort were brought on by my daily runs on the beach. Over the years, though, I realized there was an emotional component and like you pointed out, the “injury” was all about thwarted movement. 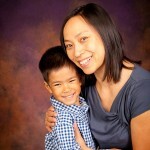 Once I realized the steps I needed to take in my career that I had pushed to the back of my consciousness while being a full-time mother (which I loved but as my son got older was eventually out of balance with my soul’s purpose) had a lot to do with the leg problems I was on my way to increased mobility. As I have moved forward with my life, returning to grad school, taking my writing seriously, releasing old patterns about love, my entire body has more energy and I’m now able to walk again without pain. Use of reflexology is a recent addition to the shamanic healing modalities I’ve used in the last several months to help move the energy and I look forward to an ever-expanding relationship with it. I am a massage therapist and have periodic trouble with my right knee. 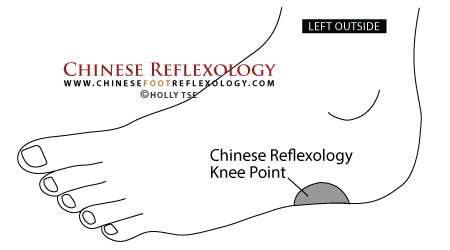 I have worked quad and surrounding myscles but the knee reflexology point has been the answer. Thank you so much!